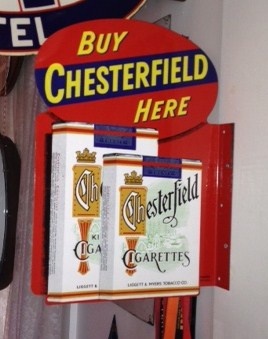 Chesterfield Cigarette Double Sided Flange Tin Sign...Liggett & Myers Tobacco Co. 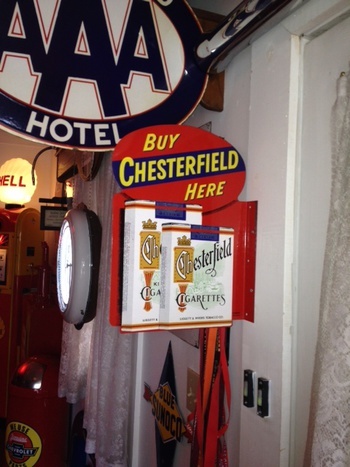 I picked this really nice Chesterfield cigarette double sided flange sign up about two weeks ago in Indiana. The sign is in great shape and looks great with the other memorabilia that I collect. Liggett & Myers Tobacco Co. has existed in some form since before the War of 1812. Thank you bratjdd for the love and the nice comment! Have a great weekend! I remember the Chesterfield commercials from early TV. In black and white and live they featured two tap dancing females(?) dressed in large cigarette packs. The only human anatomy to show were their legs and feet. What was really remarkable to me, was the fact that as one set of legs were clearly adult the other were child size in advertising tobacco. Thank you EJW-54 for the love! Have a great day! Thank you very much aghcollect for the love! I also remember the live TV ads. I have a Chesterfield bookmark with Perry Como on one side and a woman on the other side (I forget who she is). Back in the day the stars endorsed and were sponsored by the cigarette companies. Thank you mrmajestic1 for the love and the comment! I to can remember some of the old cigarette ads. One in particular was the "Call forPhilip Morris"
Thank you mtg75, shughs and fifties50s for the loves! Thank you Trey, walksoftly and kerry for the loves! Thanks walksoftly for the compliment! Thank you trukn20, Longings and RAD21289 for the love! Thank you vanskyock24, sanhardin and AntigueToys for the loves! Thank you MooreAntique, sugargirl and Chevelleman69 for the loves! Thank you egreeley1976, Designer and leighannrn for the loves! Thank you crswerner, rustyboltz and tom61375 for the loves! Thank you geo26e, Nova and fhrjr2 for the loves! Thanks Nova and fhrjr2 for the comments! Thank you chevy59, SEAN68 and chrissylovescats for the loves! Dad was a Chesterfield man. Thank you rlwindle for the love and the comment! My dad smoked also. Thank you Frankiefig for the love! Thank you snowman3, MountainGirl, vintagegirl and usedcarlady for the love!